Captains Solid Brass Binoculars with Leather Case 6"
The Hampton Nautical Brass Binoculars with handle is a pocket sized nautical treasure. This is a perfect gift for the nautical navigator or the theatre fan in your life. Focusing is accomplished using a knurled focusing ring on top of the binoculars. These binoculars have in-line prisms for improved field of view and have precision ground glass 1.75 inch (44 mm) diameter objective lenses. 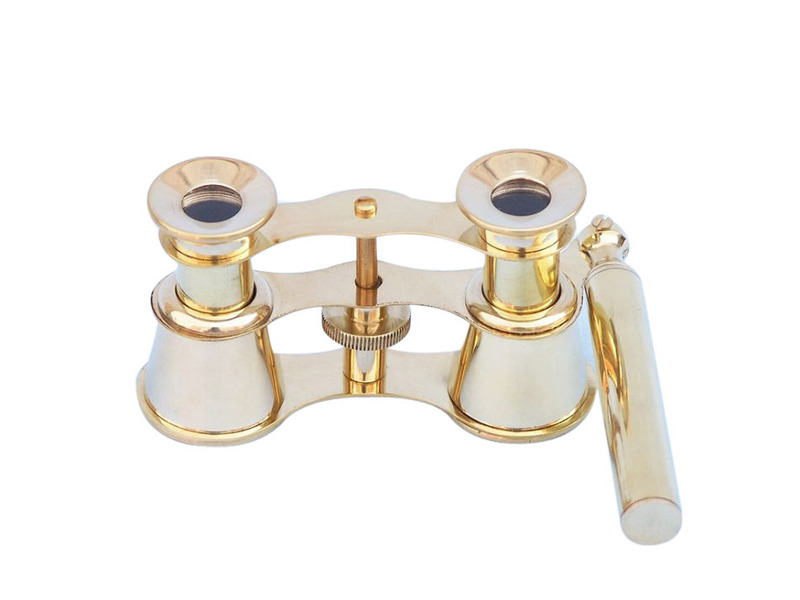 The solid brass handle rotates to enable you to focus the binoculars up or down. The Hampton nautical solid brass binoculars with handle also comes with a handmade leather case. 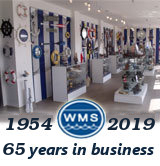 Created at the same time as the earliest brass spyglasses, binoculars have become a common and essential tool in personal, nautical, and military life. Like the brass telescope, the binocular has been practically unchanged since the 19th century. The first binoculars, much like telescopes in the 1600s, used quartz crystal as the lenses, producing blurry and unreliable images. To achieve greater magnification and clarity with these ancient nautical instruments, the only method known was to increase the size of each lens, creating incredibly large and unwieldy telescope and binocular designs. It wasn’t until 1854, when the Porro Prism was developed by Ignazio Porro, that handheld devices became possible and practical in everyday use. Using these double prism designs, which bent light in a Z-pattern, binoculars and the brass spyglass became increasingly smaller and more reliable, and in the 1880s the Roof Prism allowed for narrower and more compact designs. With these innovations binoculars, as well as the brass spyglass, spread throughout Europe and were utilized by sailors and pirates of the day.